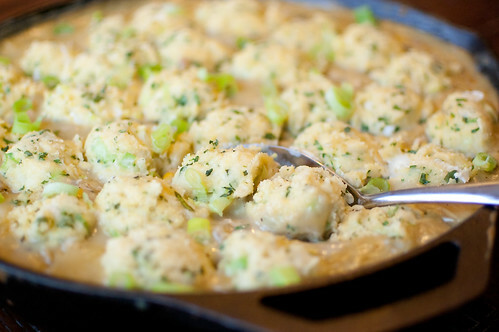 Nothing says comfort food like chicken and dumplings. And nothing makes me drool quite like Mexican food. Combine the two? You have a truly awesome dinner. After hearing Tara rave over Pam Anderson's Perfect One-Dish Dinners, I "looked inside" on Amazon, and knew I had to have it. There were several recipes that I knew we would love right off the bat. I ordered it right then and there - this was the first recipe I made from it, and we went nuts over it. It has the creamy, comforting essence of chicken and dumplings, but the flavors are kicked up a notch by the addition of salsa verde and lots of fresh herbs. The dumplings are soft and flavorful: they are made with a mixture of cornmeal and flour, and they are peppered with cilantro and scallions. The stew tastes bright and fresh thanks to the salsa verde. I also added some onions and corn for more veggie power. And the best part of this recipe? Its on the table in under an hour. I probably made things more complicated than they needed to be, first by making my own salsa verde, and then by adding extra veggies, but for a dinner as homey and comforting as this, I don't mind the extra work. Heat the butter over medium heat in a large ovenproof skillet. Add the onions and cook until softened, 5-8 minutes. Add the garlic and cook until fragrant. Whisk in the flour to make a paste. Mix the broth, salsa verde, and evaporated milk in a medium bowl and whisk into the skillet all at once. Whisk, vigorously at first, until the mixture simmers and thickens to a sauce consistency. Stir in the corn, chicken, and herbs. Season with salt and pepper to taste. Heat through, remove from heat, and cover to keep warm. Meanwhile, heat the oven to 400 degrees. To make the dumplings, heat the milk and butter in a small saucepan until steaming. Mix the flour, cornmeal, baking powder, salt, scallions, and cilantro in a medium bowl with a fork. Stir in the milk mixture to form a smooth, firm dough. Use a medium cookie scoop, scoop dough from the bowl and drop onto chicken mixture. Return the skillet to a simmer over medium-high heat. Cover and transfer the pan to the oven. Bake until the dumplings are cooked through, 15-20 minutes. Serve. These sound delicious. I love this idea- I'm adding it to my 2011 cooking list! I got this book for Christmas and am loving it. This recipe, in particular, was a hit, but the salsa we used was just a hair too spicy. I wish you would have used a brand you could recommend. Sorry! The great thing about making your own salsa is that you can control the spice level. I do actually like salsa from Trader Joe's though! Mexican combined with comfort? Is there any downside to this meal at all?? Sounds amazing! I'm with you. I love Mexican flavors and I love chicken and dumplings. Will definitely try this. This looks super good and filling, my hubby would so approve. this looks amazing, Josie, and is one of the recipes I've been dying to try. so glad you love the book so far - i knew you would! Well maybe now that you have it I won't have to get it :) I love her book "How to Cook without a Book," it is amazing! wow, this looks amazingly delicious! I tagged this awhile ago and now that is is snowing and they are calling for a blizzard I figured it was the perfect meal for tonight. It was amazing! Thanks so much for posting. My husband and I made this recipe while we were snowed in this week. I really liked the flavor of the "soup", but our dumplings turned out really firm, not soft. Not sure what we did wrong. It was still good. I assume the corn meal gets mixed in the flour & other dry ingredients? I love your Mexican themed recipes. Keep them coming! We had a version of this last night for dinner and it was fantastic! It is perfect cold weather food. Thanks so much for the inspiration. So looking forward to making this during this week! I made this the other night for dinner and we really enjoyed it. So tasty and comforting! Thanks for the recipe! The flavors were fantastic - I love the additions you made to the original recipe. Thanks! Josie - I've been very happy with the Frontera/Rick Bayless Salsa Verde Enchilada sauce in the pouch and the jar (I prefer the pouch) compared to other brands. So, when I can't get tomatillos (lucky you in a big city! :)), they're a great substitute. Thanks Ana, I'll have to remember that if I can't find tomatillos!